I picked up a nice ripe cantaloupe from my co-op yesterday specifically to make this smoothie recipe, which was gifted to me by a faithful reader. Thanks, Mari! For whatever reason I haven’t been consuming much melon lately, but that’s going to change. The cantaloupe and this smoothie were ridiculously delicious. Cantaloupe is rich in vitamins A and C and is a good source of potassium and beta-carotene. This nutrient profile offers powerful antioxidant and anti-inflammatory support to your body. Kefir is a fermented beverage teaming with probiotics and friendly flora that support proper digestion and gut flora, which are vital to good health. This smoothie isn’t as thick or creamy as most of my recipes, more like a lassi or “fruity milk”, which is light and refreshing and perfect on a hot summer day. However, if you’d like to thicken simply add ice cubes until your desired consistency is reached. Feel free to substitute milk if you don’t have kefir. Enjoy! This is also my first recipe featuring nutritional data, which I’d love feedback on. If you try this nutritious and delicious cantaloupe kefir smoothie please leave a comment below. Happy Blending! Very glad you liked it, Ryan! The same recipe tastes good with honeydew too; most melons except watermelon, bitter melon and horned melon will work as long as they are RIPE! The addition of nutritional info is a very good thing and I think a lot of people will find it helpful. My wussy blender needs to have the coconut oil drizzled in through the aperture in the lid *while it’s running* to avoid getting chunks. I’ll include a little bit of additional commentary from my original note – “Of course you can use less honey, or none at all, or use stevia, but I have this incredible local raw honey that is really flavorful, not just “sweet” (IMO the mark of a poor quality honey), and it really punched up the floral notes of the cantaloupe. Speaking of floral, a splash of orange-flower water (generally available from Middle Eastern, Indian, and some Southeast Asian markets, and sometimes in the “ethnic” area of supermarkets) instead of the vanilla would be divine.” And it most certainly was! I only used 1 tsp since I just wanted a faint hmm-what-IS-that-hint-of-something? but of course, add to taste. By the way, flower waters – hydrosols – have many health benefits of their own, and are wonderfully compatible with many smoothie-able fruits and greens. (Raspberries and rosewater is a heavenly combination.) Of course, make sure your hydrosol/flower water is food-grade as not all of them are, and *DO NOT* DIY rosewater with commercial roses! Really appreciate your site, and great information. 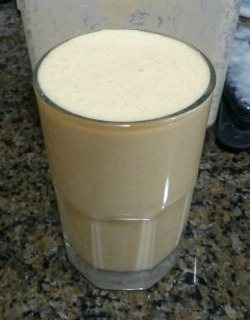 I’ve been making kefir for approximately 2 years now, and make of variety of smoothies. No specific recipes, however. The nutritional information you provide with your recipes is a blessing, for sure. I want to clarify something. When you list the calories and nutrients, that info includes just the basic recipe….correct? I’m hoping to find a chart/resource for quick reference on those “add on” ingredients since I know there in lies my down fall. Good for you – kefir is wonderfully delicious and super nutritious. Correct, the nutritional information is for the base or basic recipe only and does not include add-ons or any ingredients listed with an “optional” next to it. Not sure about a chart or quick reference guide. I use cronometer.com to calculate the nutritional info. Actually, if you search Google like so “avocado nutritional information”, all the nutritional info is listed to the right in a pretty nice layout.